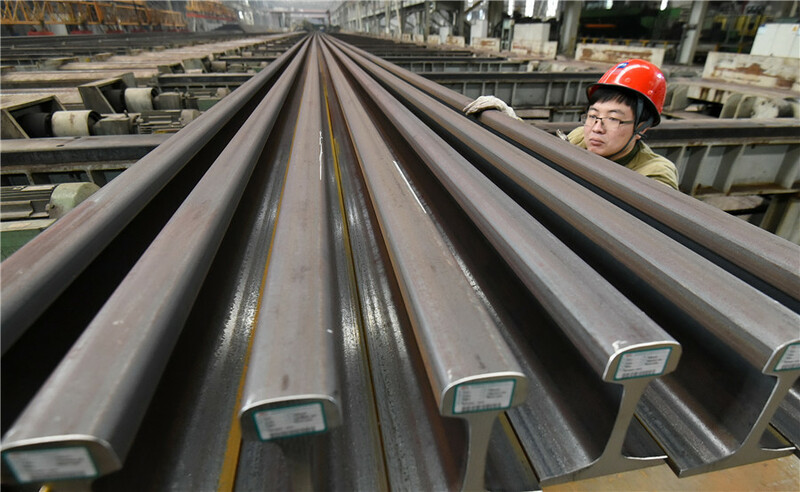 Crude steel production capacity in Hebei province and Tianjin will be capped at 200 million metric tons and 15 million tons by 2020, as part of China's efforts to optimize the iron and steel industry, a senior government official said. "There is too much capacity in the Beijing-Tianjin-Hebei region and the surrounding areas, as well as the Yangtze River Delta region," said Lyu Guixin, an inspector with the raw material department of the Ministry of Industry and Information Technology. "The Beijing-Tianjin-Hebei region takes up only 2.2 percent of China's territory, but accounts for 25 percent of the nation's crude steel output." Although official figures from the Chinese authorities are not available, Zeng Jiesheng, chief analyst with steel e-commerce platform Ouyeel.com, told Chinese media earlier that the iron and steel capacity of the Beijing-Tianjin-Hebei region stood at about 280 million tons. Besides, most of the steel firms in the region still use blast furnaces that are more polluting than electric furnaces, which results in huge energy consumption and pollution discharge burdens, according to Lyu. To better protect the environment, it is not enough to relocate the production capacity from one place to another within a province as some local governments have done, he added. Lyu made the remarks at the 2019 China Iron and Steel Development Forum, which was jointly held by the China Metallurgical Industry Planning &Research Institute and the Chinese Academy of Engineering in Beijing over the weekend. Since 2016, China has made remarkable progress in reducing overcapacity in the sector, fulfilling the upper overcapacity reduction goals for the 13th Five-Year Plan (2016-20) two years in advance. The utilization rate of crude steel capacity has risen from 70 percent in 2015 to more than 80 percent now, according to Lyu. However, Chinese authorities will continue to curb any tendency to increase iron and steel capacity, and the focus has shifted from cutting overcapacity to improving the industry's high-quality development, Lyu said. The high profits in the sector last year, which were a result of slashed capacity in the previous years, have prompted the attempts to expand steel capacity illegally, according to him. "For the next phase, it is critically important to keep the overall capacity from growing, while at the same time to optimize the capacity layout in the industry and increase product quality to achieve high-quality development in the sector," he said. Lyu also revealed that the authorities will carry out a random inspection on illegal steel production activities this year, through means such as satellite remote sensing, electricity consumption monitoring, and illegal production activity reporting platforms. Liu Zhenjiang, secretary-general of the China Iron and Steel Association, urged the industry to be aware of the fact that growth may outpace demand in the sector. "China's steel output grew rapidly in the first quarter of 2019, and crude steel output from China accounted for more than half of the world total, a record," he said, adding the increased output has led to increased steel inventories. China's iron and steel industry reported profits of 470.4 billion yuan ($70 billion) in 2018, surging 39.3 percent year-on-year, while crude steel output grew 6.6 percent to 928.26 million tons, according to the National Development and Reform Commission.